I have been extremely busy lately, but I can't afford to miss two weeks in a row. Dear followers and non-followers, this is one of those quickies, I hope you enjoy and comment. It appears the turnout for this premier has been underestimated, or else she is VERY early. Really interesting angle and layout! 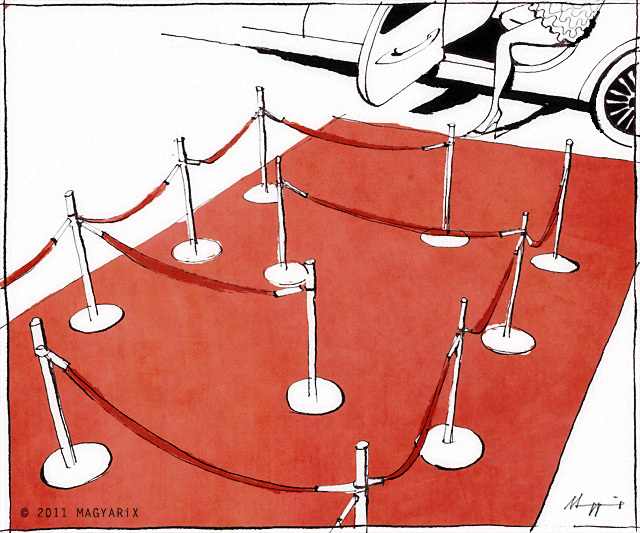 Just enjoying the lines, the colour, the layout, and THEN I notice the maze of velvet ropes. Fun. Toronto's gone crazy for Tiff, so it's pretty much on topic here. Agree with Ted, interesting layout...makes you wonder about the flimsy boundaries...that couldn't really serve much as a strong barrier, but none the less work well as a visual guide.